Local and national tattoo artists will be present for three days showing off their intricate ink creations, designing one-of-a-kind designs for you and taking your appointment right on the spot for your first or next tattoo. The show lasts for three days. Tattoo artists make appointments or take walk-ins, if they are available, to add their works of art onto any blank area of skin that you have available. There are small, dainty, colorful tattoos suitable for an ankle or a shoulder. There are large, intricate tattoos, that cover an entire head, back, arm or leg. All the tattoo artists have portfolios of tattoos from which you can select, or you can bring a sketch and have them design something for you. There are several booths where you can get piercings, jewelry, clothing and supplies. Snacks and beverages are also available. 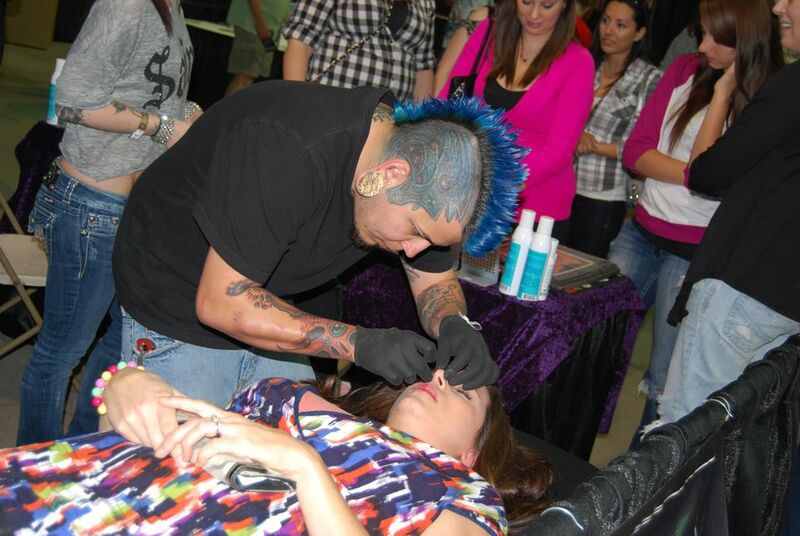 Like other tattoo shows, the Body Art Expo is almost as much about the patrons as it is about the vendors. People love to show off their body art! Friday, February 15, 2017 from 2 p.m. to 11 p.m.
Saturday, February 16, 2017 from 11 a.m. to 11 p.m.
Sunday, February 17, 2017 from 11 a.m. to 7 p.m. Here is a map with directions to the Arizona State Fairgrounds in Central Phoenix. Admission is $20 each day, sold at the door only. Children under 10 are admitted free with a paid adult admission. There is a charge to park at the Arizona State Fairgrounds. Besides all the tattoo/piercing artists and vendor booths, there are tattoo contests, human suspensions, a freak show, beerfest,hot stud contest, hot babe contest, art show and musical entertainment. There are no advance or online sales. All tickets are sold at the door, cash only. ATMs are available. Beware of buying tickets anywhere else than at the front gate. People presenting counterfeit tickets will not be allowed to enter. There are no discount ticket options. If you made an appointment in advance with a tattoo artist, you may be allowed to enter at the head of the line. Get there before your appointment time to make sure you can get in on time. The website indicates that there are hundreds of booths, and that it is the largest tattoo expo in the world. Neither one of these statements seem to be the case, in my opinion, although maybe they refer to the California show and not the Arizona show. At least that was my impression when I attended in a previous year. If you don't have an appointment and you'd like to get a tattoo here, get there early. Most artists are not busy during the first hour or so of the show. Then it gets busy! Children are welcome. There are temporary and henna tattoos for the kids. Tattoo laws are strictly enforced. No weapons allowed, no trouble wanted. No cameras with removable lenses, no video. Throughout each day there are contests in various categories. It's fun! Sample categories might include Best Unusual Tattoo, Best Oriental Tattoo, Best Small Color Tattoo, best Sleeve Tattoo -- you get the idea. There is a fee to participate in contests and other restrictions may apply. Be aware, especially if you are easily offended or bring children, that you may see bare body parts, hear profanity or see images or tattoos that might be disturbing to you or the kids. If that sort of thing bothers you, you might not want to go. If you are not a registered vendor, you may not advertise your product, hand out fliers or any other promotional materials in front of or inside the show. This is strictly enforced. If you are from out-of-town, here are some hotels in the vicinity of the Arizona State Fairgrounds. Have more questions? Visit the Body Art Expo online. All times and prices are subject to change without notice. The Super Bowl Isn't Just About Football. It's Time to Party!